INJURY-hit Fairfield Villa are hopeful of having crocked captain Lewis Cosgrove back fit before Christmas. 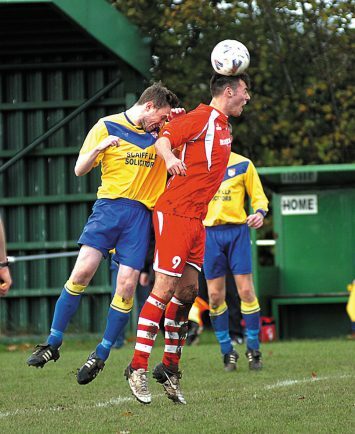 The influential centre back suffered knee ligament damage in the final moments of Fairfield’s hard-fought 0-0 draw against Alvis Sporting two weeks ago. This latest injury set back has merely added to Villa’s woes as they could only field 11 fit players to face Knowle who ran out 5-1 winners last week. However, Fairfield general manager Paul Oakes told The Standard Cosgrove could return in time for their run of festive fixtures next month. “Lewis is massive for us as he is our captain and holds things together at the back,” Oakes said. “But sometimes he is too brave for his own good and with literally the lask kick of the game he went 100 per cent into a tackle and felt his knee go. “We have been to the physio with him and he has strained his knee ligaments. Fairfield have also lost defender Rory MacFarlane, but Oakes said he was confident of having 16 players ready to take on Paget Rangers in the second round of the Smedley Crooke Memorial Charity Cup tomorrow (Saturday). Oakes has also been boosted by the signing of Shane Trossell from Perrywood and the availability of Chris Lowe who he believes can fill Cosgrove’s boots. “I have managed to pursued Chris Lowe to play this weekend,” Oakes said. “He is a very good defender who is strong in the air and in the tackle. He has other commitments as he has a young family which we fully accept. “But he said ‘I will help you out when I can’ and he is available which will lessen the blow of Lewis not being there. Oakes added: “Even though we lost 5-1 to Knowle we hit the woodwork four times, so we have got no reason to go there without any confidence. “It is a nice playing surface at Paget which will suit us and we are looking forward to it.